• Does your amp make strange noises? • Has it gradually lost the quality of tone it once had? • Is it blowing fuses? • Has the vibrato or reverb quit working? • Is it loosing power or cutting out? We found that many of our customers have never even heard their amp operate at maximum performance until after having it properly repaired. Let us go through your amp and let you know what is not up to spec. or in danger of causing problems in the near future. We specialize in the repair and tone resurrection of vintage and modern tube-type guitar amps, bass amps, PA amps, analog mixing consoles, tube stereo Hi Fi amps. 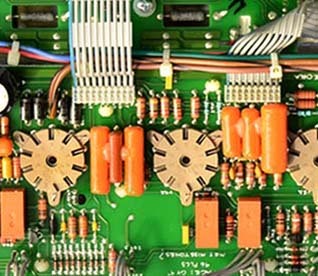 Click Here for more info on Hi Fi tube amp repair.